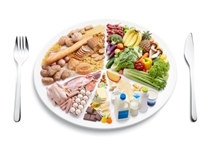 What Are the New Dietary Guidelines? Should You Follow Them? Many people choose a diet based on health concerns. For instance, diabetics can improve their health when they follow a low-glycemic-index and low-glycemic-load diet. Also, the DASH diet (dietary approaches to stop hypertension) can benefit those with high blood pressure and cholesterol, and includes heavy amounts of low-fat protein, whole grains, fruits, and vegetables. For nearly 100 years, dietary guidelines have formed the blueprint for the general public’s recommended eating habits. Whether people follow the guidelines is a different story; after all, approximately half of all American adults suffer from one or more chronic diseases, including hypertension, type 2 diabetes, cardiovascular diseases, and cancers, which can all be linked to diet. That’s 117 million people suffering from chronic diseases associated with poor diet choices! Not to mention that over two-thirds of adults are considered overweight or obese. As I mentioned, most of the time, these conditions are preventable by adopting healthy eating habits and getting regular physical activity. It is no coincidence that diets geared to improve health conditions like hypertension and diabetes feature similar qualities to the dietary guidelines, especially when it comes to the inclusion of high amounts of fruits and vegetables. Every five years, a committee of top nutrition experts advises the government on the best dietary approach to help prevent those chronic health problems. These suggestions tend to also reflect the latest nutritional research. What Does the Health Expert Panel Suggest for 2015? The focus should be placed on healthy foods, and not nutrients like carbohydrates, fiber, or protein. The guidelines should consider the importance of sustainability, and how the environment impacts the diet. The guidelines should rescind the overconsumption warning for cholesterol, as there is much evidence to support that the overconsumption of cholesterol and most dietary fats are not harmful toward your health. The DGAC recommends a tight restriction on sugar within processed products, which should contain no greater than 10% of a person’s daily calories. The committee now suggests a connection between mental health and foods. It remains to be seen if the two government agencies will approve of the committee’s report and implement all of these suggestions. In the meantime, should you listen to the health experts? Should You Follow Government Health Recommendations? High in fruits, vegetables, legumes, nuts, whole grains, and seafood. Notice there are a lot of the usual healthy foods found in typical recommendations, but the DGAC also mentions that the dietary suggestions should be tailored to a person’s biological and medical needs. The DGAC has at least provided the public with some good recommendations, and I think most will agree that a person’s health is greatly considered. It is also admirable that a plant-based diet continues to be one key focus. However, I think there needs to be another dietary shift regarding recommendations to the government, especially with how chemicals play a role in our food and lead to degenerative diseases. There should be a greater emphasis on local and organically grown foods, which are void of pesticides, herbicides, and other chemicals. Dairy products still weigh heavily in the recommendations, and they contain antibiotics and growth hormones. They can also cause inflammation in the body, which leads to many health problems. You will see the USDA’s official new guidelines toward the end of this year, but that shouldn’t stop you from using some of the committee’s suggestions, including the focus on plant-based foods and greater sustainability. What do you think of the recommendations? You can comment on the DGAC report until April 9 at the Office of Disease Prevention and Health Promotion web site or have your say in the comments section below. Almendraia, A., “What To Make Of The New Proposed Dietary Guidelines,” HuffPost Healthy Living web site, February 21, 2015; http://www.huffingtonpost.com/2015/02/21/dietary-guidelines-advisory-committee_n_6724416.html?utm_hp_ref=healthy-living. “Dietary Guidelines for Americans, 2015,” Office of Disease Prevention and Health Promotion web site; http://www.health.gov/dietaryguidelines/2015.asp, last accessed March 26, 2015.